Crafty Garden Mom: It's Sew Mama Sew Giveaway Day! I LOVE to give and get presents and Sew Mama Sew has a great opportunity for us all to hit the motherlode in their Giveaway Day! SO many bloggers are putting wonderful stuff up for grabs, just for stopping by. What a great selection of "blenders" fabrics! These will go well with so many colors and themes in your sewing projects. To enter, please leave a comment below telling me what project this charm pack would be perfect for. Be SURE to either leave an email address or make sure you are not a no-reply blogger so I can get in contact with you if you win! Followers of my blog will have an additional entry, so please leave another comment if you are one--new followers are welcome, too! The giveaway will end on May 10, 2013 at 5:00 PT, and it is open to international readers as well as those in the US. If I were to win I would make a table runner for my niece out of it. She is getting married this summer and I think she would love these fabrics! Thanks for the giveaway. Oh wow! Such a great pack!! I think I'd combine it with a few solid fabrics and make a small quilt... one that would could take on picnics! I love this fabric and it would be great in a quilt. Thanks. Sweet giveaway & sweet charm pack! I think it would be nice as part of a low volume quilt. Thanks, Tanesha! A sweet little lap quilt for when I was editing photos or blogging. This looks like the beginnings of a great reading quilt! And I'm a longtime follower. I'd use it to make a pouch for my iPad. After all, everything on my iPad is Noteworthy. This will be great to use in my small stars quilt to be! A bag for the library. Thanks! 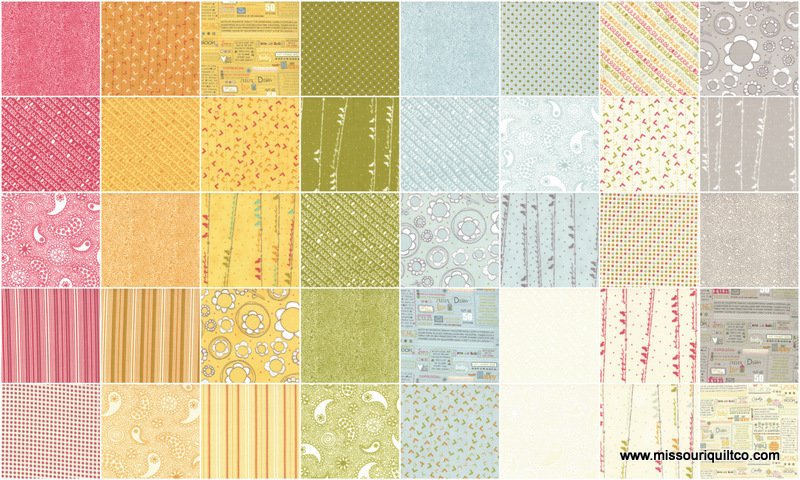 Oh, it would be hard to pick just one project, but perhaps a simple patchwork quilt so the prints can really shine! Thanks for the giveaway! This would make a cute playmat. Thanks. I would love to make a tote and pouch from Noteworthy - funky and interesting without being "in your face". it would make an awesome quilted tote! :) thanks for the chance to win! It's perfect for a new tablerunner for my dining table! It would make a great quilt as you go library tote. Thank you for the giveaway! it would make a great bag! Love to make bags. A patchwork basket for my counter or table, this would be the perfect summer pack to make that from! Thanks for the chance to win it! The fabric would be good for a little quilt for my daughter. A quilt for my friend's daughter! One of my close friends is having a baby girl in September and I would love to make a little quilt for her with these. What a sweet charm pack. I'm making my first quilt not so I'd probably use it for my second! I saw a cute charm pack bag this weekend and would love to make one with this charmpack. Thanks for the giveaway. I would love to make a cover for my sewing machine with this fabric and some little fabric buckets! Thanks for the chance to win! I'd use it to make a sweet baby quilt. Thanks! I think a bag or a small quilt would be great. I REALLY love this line!! I think it would for a great teacher gift - something like a fabric bulletin board I've made in the past. What a lovely giveaway! I love charm packs! This one would be great for a baby-sized quilt. Or, for my other favorite way to use charm packs: stripped apart and put to work in lots and lots of other projects (yet to be determined). :) Thanks for the chance to win! 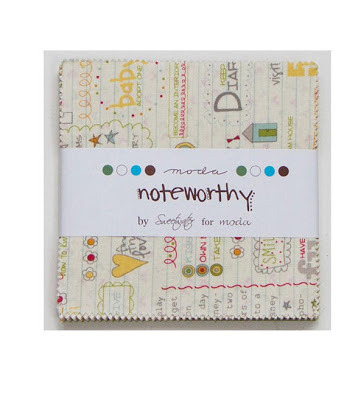 I love Noteworthy! I also love using charm packs to make puff quilts. A baby quilt for my first pregnant friend. Would be super-cute! I would use it in a Schnibbles! For this months parade! I would love to make placemats with this great charm pack. Thanks for the chance to win! I think it would be great in a simple baby quilt! I'm not sure what I would make with this right not but I love the line so I'm sure it wouldn't stay too long in my stash! I actually would use a bit of it here and a bit there - I like incorporating a little bit of texty goodness in everything I make! I think they would make a great summer quilt. Thanks for the fun giveaway! I currently have an obsession with this fabric!! I'm wanting to make a picnic blanket for my daughters teacher! It's perfect for a baby quilt, the print is really nice! Thank you!!! My daughter's school has started eating lunch outside, now that the weather's warmer. She's been bothering me for a picnic blanket - this would be great! A table runner would be super cute! Thank you for the opportunity to win! I would love to try a quilt for my granddaughter with it. Thanks! I think it would be perfect for some pillows or a table runner! Think I'd use it to teach my best friend basic piecing skills. She went with me to a recent show and now wants to start quilting! I have a Nancy Drew charm pack and some other fabrics that remind me of my childhood. I think the noteworthy would go great in that project. Just added you to my Bloglovin' list. I'd make some great pillows. Thanks so much-love this line! It would be great for a baby quilt and some bibs. it would be perfect for making a gift for my cousins new daughter. I would like to make a lap quilt, thanks for the chance to win. Great for a teacher's quilt! Thank you sweet girl but the last thing I need is more fabric. In fact I should send you something! Have you ever worked with Sari Silk? It is a wonderous fiber...If you would like some let me know. I am expecting 5 bundles from India via Hawaii this week. Thanks for sharing your time and talents. Just finished reading Sarah's Key...it has been years and years since tears poured down my face as I was reading. Great read, sad story...saddest yet it is fact based. I once asked my Jewish Bubbe how did you know that everyone was gone from you village. She stroke my head and told me the packages of clothes kept coming back, as we knew. Now that is more than you wanted to know I am sure. She passed when I was little. But also taught me if someone does not like someone because of the way they to talk to G___ , the color of their skin or how they talk...take to home quickly because they will not like you either..they just haven't gotten to you yet. Sorry for all the words and more words. Thanks for the chance to win! I would love to make a quilt for my cousin's expected baby. 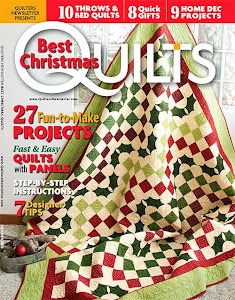 I make lots of lap quilts for Christmas gifts. By combining the charms with blenders and fabrics from my stash I could make a great quilt for one of my sisters. This would make a very cute tote bag. I have a couple of zakka ideas or possibly some paper piecing. My five year old is starting to sew. As much as it would kill me to share, a pre-cut charm pack would be perfect for her first quilt - she's working on a quilted cushion cover at the moment. I would use these to make a quilt as you go version of the Weekender Bag by Amy Butler. I know a soon to be 9 year old who would adore it! This charm pack would be made into a quilted bag for me. Thanks for the chance to win! Baskets for my studio/study to store all kinds of stuff! LOL!!! Thank you for this give-away! Love the fabric you are offering!!! I would make a nice lap quilt. Thanks for the chance to win. Hi Tanesha. I think that fabric would be perfect for a laptop cover. And I'm a follower, and podcast fan! I think this charm pack would make a super cute quilted tote bag! I love this line! Thanks for the chance! And I'd definitely make a summer tote with it. I 'd love to win! I'd make a lap quilt for our charity. I would make a pillow or wallhanging. I especially love the bucket list fabric and I would like it as a reminder that I should start working on my bucket list. Thanks for the wonderful giveaway and for your inspiring blog. I follow you on Twitter (aggiesmom1). A patchwork tote or pouch! I have an original design I like to use charm squares for and this line would look great. I am thinking a baby quilt or quilted tote bag! Thanks for a chance to win! This would be great for a pillow case or the cover of my new sewing machine! No idea but I love it. Looks great for a quilt, just needs friends. I just got back from a sewing weekend event at Nancy's Notions and think Eleanor Burns' Swirling Stars pattern (I think that's the name) would be great in this. I love half square triangle quilts from charm packs! I think this would make a cute patchwork tote bag. Thanks for the chance to win! I would definitely use this in a quilt! Could I simply not just use this pack to pet!!!!! this charm pack would be perfect for a book bag. thanks for the giveaway. I absolutely love the Windy Days quilt pattern at Moda Bakeshop. Perfection!!! Maybe a disappearing nine patch quilt with some solids to compliment the fabrics. Thanks for a lovely give away. Love that line! That charm pack would be perfect for a picnic quilt! I'd love to use Noteworthy to make patchwork totes for some of my teacher friends. I will make a baby quilt for my niece. I'd use it to make stars for a baby girl's quilt. I like to make quilts with lots of different fabrics lines, so I'd use the charm pack in that. I want to make Sarah Fielke's Whirligig quilt and this would be perfect to use in it. I am totally a follower of your blog!!!! I think this would be great for a baby quilt for a friend, but it is such a pretty line that I'd struggle to part with it! It would make a lovely baby quilt for the new baby of a fiend of mine. I would love to make an ipad cover + a matching pouch, thanks for the chance to win. It would make such a beautiful pillow or e-reader cover. Thanks for the giveaway! I think I would make a patchwork tote or craft apron! Love that fabric! Thanks for the giveaway! I'd make a cover for the iPad. Thanks for the chance! Starting small (working up to a quilt) I think I'd make some coasters or table mats. A tablet cover for my daughter! :) And I could also cover a journal for her in it too. :) Thanks for the chance! Amazing giveaway,thank you for the chance to win it.Maybe little blanket and the bag.Have a lovely day. I love this line too and would make a table topper from it! I'm thinking a nice large tote bag to hold knitting projects. You can never have too many bags! I'd take the suitable coloured charms into my own quilt and rest I'd save for whenever an inspiration hits me. I think it would be good for a quilt or I might pull out a few colors it make a table runner. I'd love to make notebook covers for my daughters. I need to make some eyeglasses cases and these would be great for them. Thanks for the giveaway! THIS WOULD BE PERFECT FOR MY UP-COMING QUILT>MAYBE A SCRAPPY QUILT IN MINI HST'S! THANKS FOR SHARING! Those would make a lovely quilt! a little ways down on my "to do" list is a noteworthy quilt, just for me. i haven't ever made a quilt just for me, but noteworthy is so stinking gorgeous that i can't resist! I love Sweetwater fabrics. I would make a table runner for my entry hall table. Thanks for the giveaway. I think I would use that in a small throw. Id make a topper for my girls piano! maybe id try a blanket ? Have a sunny day and thank you for the chance ! i would LOVE to make this into a baby blanket!! I think this fabric would make a terrific tote bag. Thanks for the chance to win it! I'd use this for a baby quilt with some solid squares! I think this would be great for some patchwork zipper pouches! a bag/tote or an apron! i am a big Sweetwater fan so I would love to win and would make it into a quilt. This would be great in a quilt! I would love to use it for a cute baby quilt. Oh I just love this range! 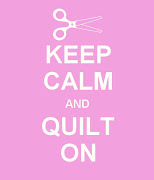 I think I would indulge myself and make myself a lap quilt!! I love charm packs. This would be great for many things. Borders on pillow cases, table topper, bags. I'd probably use it for a bag. Thank you for the chance to enter. It would be fun to use to make something for my daughter's room. Either a cushion or a fabric tote for storing some of the "treasures" she accumulates. This would be great for a Quilts for Kids project! I would use this for pillow covers with half square triangles. A lovely little lap quilt. Wonderful giveaway, thanks so much. I would make a picnic quilt. My grand daughter has requested a couple of pillows. Those would be so cute for a teenager's room. Thanks.